..:: Mark Eager - ITA Magazine Feature ::.. I grew up with music all around me. My family were members of the Salvation Army and everyone I knew sang or played as if it was the most natural thing in the world. Every Sunday afternoon there would be concerts and I would perform in bands, choirs, and as a soloist from the age of seven. Conducting and writing arrangements for various ensembles soon followed. About 1973, I saw the Philip Jones Brass Ensemble on TV and realized that people actually did this as a job! After studying with Anthony Parsons, co-principal trombone of the BBC Symphony Orchestra, and at the Royal Academy of Music, I began a playing career that included most of the major orchestras of Great Britain. In 1993 I was appointed principal trombone of the BBC National Orchestra of Wales (BBC NOW). In my tenure with the BBC NOW, it was my good fortune to have the opportunity to play some of the finest trombone concerti; two of which were commissioned by the BBC NOW for me. The management at the BBC NOW were very keen to attract the best players. One of the ways they did this was by offering principal players concertos on a regular basis - usually once per season. 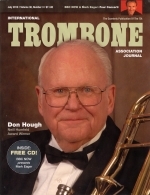 The Orchestra did much to promote the trombone as a solo instrument. In 1998 the BBC NOW, myself, and Christian Lindberg were awarded the ITA Orchestral Recognition Award for our promotion of the trombone as a solo instrument. The concerti for the CD included with this issue are all quite different in some ways, and yet they all treat the trombone as a solo instrument with the great respect it should command. There are no flippaticies, quirks, or jokes here - all the pieces have musical integrity and depth so that is why I chose them for this CD. The recordings excepting the Françaix are from live radio broadcasts and they have not been edited or refined in any way. In the 1994-95 season at the BBC NOW, we were playing several of John Piekard's pieces and his writing for brass was exceptional. I asked him if he would consider writing a trombone concerto for me and he was immediately excited. We both agreed that the trombone should be conveyed as a noble and sonorous instrument in a serious piece that had integrity and depth. The first performance was to be at St. David's Cathedral so John had the idea to start with a solo trombone passage off stage and out of sight - the tone echoing around the vast Cathedral as if from "on high.” The effect was magnificent. The orchestra then enters and the soloist has a number of bars to walk to the conductor's side and continue playing. Before writing the concerto John and I had several sessions together and he was particularly interested in the harmonic series and the range of the instrument. The piece therefore has well written harmonic slurs and a range between pedal E and high F.
What I like about John is that he is very forthright and says it as it is. He came to a recital of mine before writing the Spindle and heard things he liked and disliked about the trombone and some of the pieces I played. He was interested in the tonal quality, sonorities, and range he could explore - not for him the fast and furious, although there are quick passages. He was very interested in the harmonic series and particularly lip slurring over the range from pedals right up. Early on we met so that I could guide him through the trombone's workings and as I was playing 1st, 2nd, 3rd, etc positions of the harmonic series he casually said with no sense of overt criticism: “OK, so the sound gets worse as you go down to 6th and 7th!” - forthright but accurate and from that day I practiced harder to even the tone out even in those long difficult positions. I also knew that if John praised me after the concerto performance it would be worthy praise indeed - and he did. John does work to deadlines and the finished product was clear, precise, and unchanged from the first I received it - with John I had no input into the style or music of the piece, only into the technical elements. Born in Bumley in 1963, John Pickard is a prolific composer with a natural inclination to large-scale musical canvases. His music has an inexorable energy and powerful forward momentum and his output includes three symphonies and a wide range of orchestral music. He is currently a member of staff of the music department at University of Bristol's Department of Music. The Spindle of Necessity was commissioned for the 1998 St. David's Festival, Pembrokeshire, with funds provided by the Arts Council of Wales, the British Trombone Society, and the International Trombone Association. It came at the end of a decade when the BBC National Orchestra of Wales vigorously championed Pickard's music. The work, composed for and dedicated to Mark Eager, is scored for strings and percussion alone and lasts around twenty minutes, falling into a series of linked sections. Based on the final section of Plato's Republic, the solo trombone represents a soldier, killed in battle, who returns from the dead to relate his experiences of the afterlife. He describes the souls of the unjust and the just making their journey to the Spindle of Necessity where they see the planets revolving around a shaft of light. Pickard's own fascinating notes on this powerful work can be read at www.johnpickard.co.uk. In 1995 my producer at the BBC asked me if I knew this concerto; I didn't but after a quick glimpse, realized that it was a hidden gem. There was no commercial recording available either so we decided to record it for BBC Radio 3. French in style, it lies high in the register and requires extremely nimble tonguing and slide work. It is in five short movements, opening with a beautiful, slow legato melody accompanied by meandering woodwinds. The second movement starts with a swift glissando which immediately raises a smile and the interaction between the soloist and ensemble enhances this joyous atmosphere. The third movement requires a mute and because of the nature of the music and the need for projection through the woodwinds, I chose to use a harmon mute, which adds tonal colour and variety. I then changed to a cup mute for the opening of the fourth movement - this is another slow movement and is the perfect respite before the effervescent fifth movement; this fizzes along using double tonguing and very agile slide movements. There is then a well-constructed written out cadenza before the final flourish. Interesting postlude: A month or so before recording the Françaix my Conn 8H Elkhart (1962) model was crushed by a falling TV camera stand in the Concertgebouw Hall, Amsterdam. I traveled to Edwards in the US and chose a new instrument, which I then used for this recording. When Saint-Saëns died in 1921, the nine-year-old Jean Françaix (1912-97) gravely declared, “I shall take his place.” Although spoken with the innocence of childhood, the young Franiçaix's prediction arguably turned out to be very close to the mark. His music displays the older composer's elegance, craftsmanship, and detachment alongside immense charm, elegance, and wit. Concertos and concerto-like works dominate Franiçaix's output and he wrote works for a wide variety of instruments. The Trombone Concerto is a late work, written in 1983 and, surprisingly, is still little known. Mark Eager recorded the Concerto in 1995 with the BBC National Orchestra of Wales and its issue now is the work's first commercial recording. The concerto is cast in five movements, running continuously without a break. At eighteen minutes the work is relatively short but, unusually, is not accompanied by the full orchestra, but by ten wind instruments. The result is an attractive score in the crisp neo-classical vein for which Françaix is so well-known. This was a particularly exciting venture for me on two counts. The first was that having recorded a number of Takemitsu's works with the BBC NOW, I had an empathy with his style and enjoyed the delicacy and precision required to play his works. The second was to play this with conductor Tadaaki Otaka - he knew Takemitsu and no one was more intimate with his style. Like Pickard, Takemitsu respects the trombone as a serious artistic force and this piece has no “show-off” moments or gimmicks - it is pure music. He does however explore the use of mutes to enhance the interest and give the trombone many different voices. Alun Hoddinott was arguably the greatest Welsh composer of our time and possibly ever (he wrote the Fanfare for Prince Charles and Camilla's wedding by the way). He used to regularly attend our performances in Swansea and he told me that having heard me in the orchestra many times and after my solo performance of Arvo Pärt's Fratres he always wanted to write a concerto for me. Initially I asked the BBC if I could play the wonderful Ritornelli by Alun Hoddinott written in 1974 for Denis Wick. Alun heard of this, came to me and said: “Why do you want to play a thirty-year-old piece? I will write you a new concerto.” I was truly amazed but met with Alun and we embarked on what was to become a life-changing experience for me. Alun and I wanted to push the boundaries and make this Concerto playable by only a few, creating a real tour de force. We collaborated over several sessions at his home which always included a wonderful lunch. I found it interesting that his singing of his initial scribblings actually sounded nothing like what he had written yet he was only really interested in capturing the mood and style that he wanted - this was more important to him than the “notes" - it is a good lesson as music is so much about personal engagement, character, and spirit, and OK we need some notes too! He liked all the energetic sides of the trombone - the sheer physicality of it - hence the rapid slide work, double and triple tonguing and jumping around large intervals. There was not much he tinkered with from the very first musings apart from the end which he initially felt didn't do the piece or me justice - the second ending is extremely hard with extremes of tonguing over wide atonal intervals in the high register - this he sent me two weeks before the first performance. This is another thing when collaborating with a composer - don't expect to get months of time to practice - deadlines are notoriously extended. The Concerto is 21 minutes of almost continuous playing, mostly in the high register and is stamina sapping. The ending that he sent was virtually unplayable but I worked on it for 4 hours every night before the concert - very fast double/triple tonguing, atonal, and stratospheric! Musically the Concerto has much of the character of Alun and myself - generating a positive, excited, and energetic view of life. I am very proud that this was the last thing I ever played on the trombone. Alun Hoddinott (1929-2008) was one of Wales's leading and most prolific composers. Concertos dominated his output and his First Clarinet Concerto launched his name internationally in 1954. When Alun Hoddinott offered to write a trombone concerto for Mark Eager, he set out to challenge the idea that the trombone is essentially an instrument predominantly given to slow sonorous sounds, full of weight and gravitas. Instead he exploited its agility and speed, writing a work dominated by fast music, calling for the utmost virtuosity from the soloist. Hoddinott took many of his influences from the baroque and, rather like one of the Brandenburg Concerti, his Trombone Concerto develops a dialogue and subtle interplay between the soloist and the orchestra. The Concerto is in two movements, each of which is a diptych made up of two sections, following a pattern of fast-very fast, slow-fast. Its premiere was given by Mark Eager with the BBC National Orchestra of Wales in Brecon in May 2004 and its duration is around twenty minutes. Mark Eager was principal trombone with the BBC National Orchestra of Wales from 1993 - 2006. Recognizing his talent as a soloist, the BBC commissioned two concertos for Mark - The Spindle of Necessity 1998 by John Pickard and Trombone Concerto 2004 by Alun Hoddinott. Mark recorded and broadcast both for BBC Radio 3, receiving much critical acclaim. Immediately after playing the world premiere of the Hoddinott Trombone Concerto 2004 Mark suffered a facial muscle injury, which ended his playing career. Mark embarked on a conducting career and is currently principal conductor and artistic director of The Welsh Sinfonia - his “clear and highly musical direction” has developed it into Wales' finest chamber orchestra. Mark is also principal conductor of Cardiff University Symphony Orchestra and Hertfordshire Wind Sinfonia, where he relishes the thrill of inspiring young people. Mark tours extensively throughout the world as a conductor, clinician, and adjudicator, most recently to South Africa, Hong Kong, Malaysia, and Australia.